It only took more than a century, but we now know how tall the Washington Monument really stands thanks to—you guessed it—science. Oh, and we know the exact location, too. Finally. Odd though it sounds, it's actually not surprising. 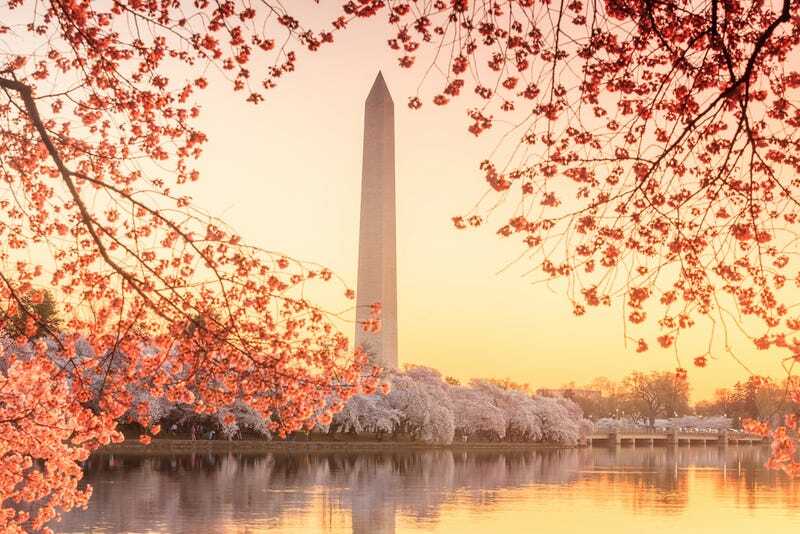 The Washington Monument was built in 1848, long before the technical standards for building height we use today were established (much less the technology to find them). "No historic surveys were of sufficient accuracy to state whether any of the other changes have occurred between them and 2014," the National Geodetic Survey explains on its website, plus, they weren't sure exactly where older measurements were taken. Well, in this case, it's important for measuring how much the monument is changing. We've covered the long saga of how the monument was damaged in an earthquake that struck D.C. in 2011, precipitating a long restoration to fix more than 150 cracks in the structure that only just wrapped up. But preservationists who want to find out how much the monument sank—or whether it's leaning at all—were out of luck, since all previous surveys weren't accurate enough to give them anything to compare it to. So, when scaffolding was erected around the monument to fix those cracks the National Geodetic Survey saw an opportunity to finally find out the exact height, since they had access to the very tip of it. That involved installing a special sensor beacon at the tip, as we wrote last year, that allowed them to take exacting GPS readings from the very tip of the monument. As no measurement is perfect, it is important to know how well such a measurement has been made. We do not know the standard deviation of the original "555 feet, 5 1/8 inches," but it is the reference to "1/8" inch that makes the measurement so curious. Did the original builders think they had truly determined the height to sufficient accuracy to justify the addition of 1/8 inch? At this time the answer remains unclear, but what is certain is that the current estimate of the height can now be definitively stated to be +/- 1/32 inches. It seems odd, but figuring out America's exact measurements is an enormous task—and the NOAA's National Geodetic Survey is dedicated to it. Not only is our earth changing all the time, but the modern tools we have to glean exact measurements of our world are fairly young. As a result of the new survey, the "architectural height" of the monument is now 554 feet and 7 and 11/32 inches. It's not a big enough change to worry preservationists, and the Parks Service tells the Washington Post that it isn't a big enough difference to "change any brochures." But it's still important, because now, the government has a baseline measurement to compare all its future measurements to. That is, until our tools get even more exacting.